What if you had to thrive in the same container as your container garden? Astronauts aboard the International Space Station dined on romaine lettuce grown on board in a specially designed planting "pillow" of substrate and nutrients, along with grow lights and sensors. This marks an important step toward subsistence gardening aboard longer space missions or even at a mars colony. "Each of the six planting “pillows” had a growth medium that includes a type of clay used on baseball fields and controlled-release fertilizer. Red, blue and green LED lights and water injections activated the seeds and allowed them to flourish after 33 days of growth." The next challenge? 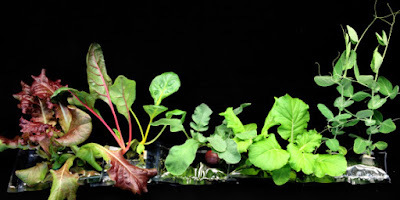 Growing plants that use more water and require pollination in space. Read more at wired.com.